The following is an essay written by Holly about a wondrous summer observation. Enjoy…. I am sitting on a beach in Long Island on a glorious sun-shining summer Sunday. A group of seagulls glides to a halt in the sand about three feet in front of me. I am taken with their gorgeous eyes so inhuman like – yellow with flecks of brown – sizing me up one eyeball at a time as birds do with sideways turned heads. There are maybe ten gulls in this group. Only they separate me from the ebb and flow of the ocean waters. As I glance from the birds to the waves I notice one gull a bit more unsteady than his friends. At first I think he is standing on one leg with the other tucked up tight as my own bird at home in his cage does when he gets sleepy. But then I see that he has only one foot. Two legs, but one foot. Now that I realize this, I am impressed at how steady he is balancing himself so well among sand, wind, waves and companions. Every now and then he hops precariously on one leg while his footless one dangles. I am worried that he will stumble but he doesn’t. He finds new footing after his move and stands tall amidst life’s happenings. And he looks pretty good too like he’s been eating well this summer. He stretches his perfect wings, feathers moving ever so slightly in the breeze. I snap a photo. I am completely engrossed by him now. Pretty soon two young teenage boys come along, happy and carefree with a bright green soccer ball. They are oblivious to the wonder in front of me. As they begin to kick their ball back and forth very close to the seagulls, the birds begin to back away one by one. But not my friend. Standing strong on one leg keeping one sharp eye on the boys he seems to say, “I am not afraid of your ball. Life’s thrown more than that at me.” Eventually the boys drift away with their ball and one by one the nine or so other seagulls come back to the spot they had fled from. They encircle the one footed wonder as if to say, “You ok? We’re here now; that was close!” The steady gull answers by bending his knees, laying his belly in the sand and resting. 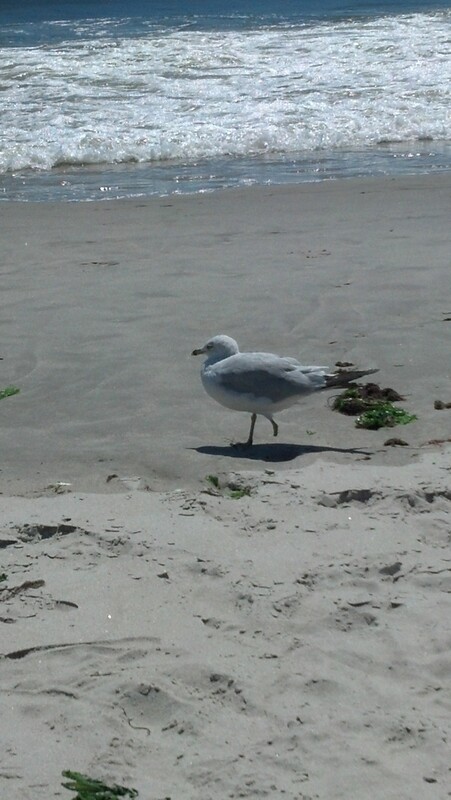 I imagine all sorts of scenarios as to how the seagull came to be with only one foot. Was he in a fight? Did he get tangled in debris? Was he rescued, rehabilitated and brought back to the beach? Or maybe he was born that way? I wonder at his majesty. I delight in his calmness, braveness, peacefulness. The beach is so crowded today. And yet he rests. It is so beautiful here. Holly and Heather’s Helpful Hint: Long Live Summer! Stay outside all thru the fall. The weather is still gorgeous in September and October. Plan a winter vacation that is somewhere warm! Take a breezy approach to your day every now and then – can the laundry wait while you lay outside with a sweater on and a good book in hand? Plan for all of the holidays and celebrations that fall and winter bring. It gives you something to look forward to. All of the seasons bring something special…but oh how we love those lazy days of summer. So there are good byes and then there are GOOD BYES. Sending your first child off to college is a big good bye. Yes, there are those who won’t even say the words. They prefer, “See you later” or something similar. Maybe that applies to the first day of preschool but college feels like it needs more. So how do you do it? What do you say? What have those of you out there who have gone before us said? It is such a time wrought with mixed emotions: pride, anxiousness, happiness, sadness…too many feelings all jumbled together and difficult to make sense of. So how do you? We think we need to process them all, slowly. We will let you know how it goes…. Holly & Heather’s Helpful Hint: Cheers to Mom! Last month marked the forty-first dance recital that our family has produced. It also marked our last. Our mother, founder of the studio, has decided to retire and we would like to dedicate this blog to her. When mom first opened her studio in 1974, there was hardly any competition. She had students pouring in from all over our little suburban neighborhood. We grew up in that culture (we were five years old at the time). Dance was as much a part of our lives as eating, sleeping, going to school; we were enfolded into the daily routine of it all. Even on school vacations she rarely had a break. Mom, as any good business owner does, worked 365 days a year more or less. Some times were harder than others but there were moments of joy – priceless friendships made with memories to last a lifetime, trips to new places, exposure to decades worth of different dance styles and music, utilizing the creative aspect of ourselves to choreograph, perform and create. So cheers to mom! It is not easy to keep a business going for forty-one years. She is now exiting the dance stage and looking forward to her next chapter. We love you!